Firstly, add the onion, garlic, courgette, mushroom and red pepper into a food processor, and blitz until finely chopped. Place a large wok/frying pan on a medium heat and add in the olive oil. Pour in the chopped vegetables, and fry them in the pan for 4 minutes, stirring. Drain the tofu from the pack, and crumble the block into the frying pan. Next, add in the dried mixed herbs, paprika, chilli powder, vegetable stock powder, salt and pepper. Stir everything together and continue to cook for a further 3 minutes. When this is done, add in the chopped tomatoes and passata. Stir everything together and reduce the heat slightly. Allow the sauce to simmer and heat through for around 15-20 minutes to fully develop all the flavours. During this time, cook your desired amount of pasta, ready to serve with the sauce. When both the pasta and the sauce are ready, remove them from the heat, drain the pasta and serve with the bolognese. Preheat the oven to 180°C (350°F/Gas Mark 4). Line a shallow baking tray with greaseproof paper. Peel the apples, remove the cores, chop into chuncks and place in a pan. Remove the stones and any hard ends from the dates. Place the almonds, dates, honey (or vegan alternative) and cacao into a food processor. Pour the boiling water into the pan and place onto the hob over a medium heat for 10 minutes. Then drain the water and add the apple to the food processor. Blend the mixture for 30-60 seconds until all combined, then scoop the mixture into the baking tray. Place in the over and cook for 30 minutes until the top goes firm. Allow the brownies to cool at room temperature for 20 minutes, then place in the fridge for 10 minutes before cutting into 10-12 pieces. 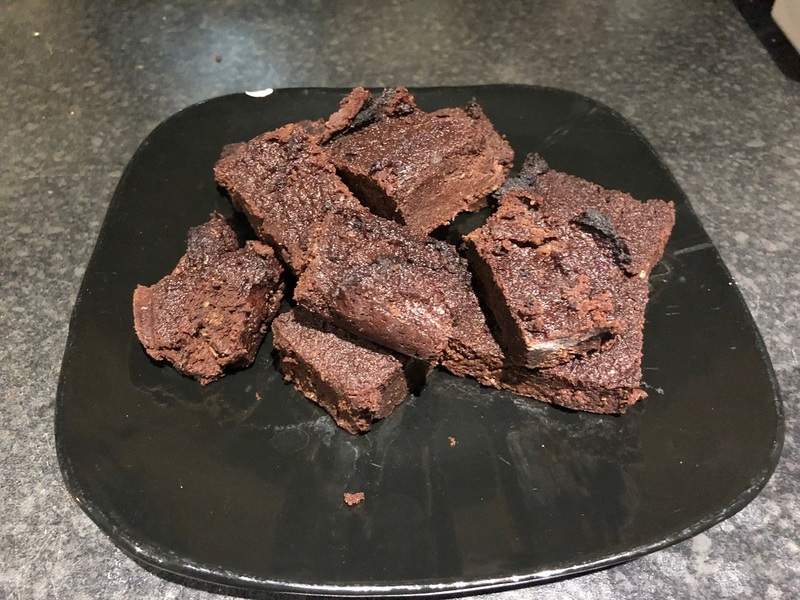 Personally I double up this recipe because 10-12 of these brownies are just not enough!